The Talent Hub International is bringing the Organisational Savvy workshops to South Africa through our partnership with Brandon Partners. 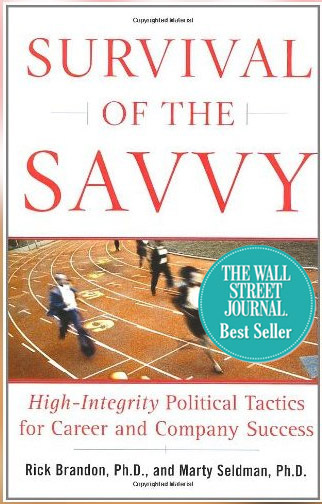 Rick Brandon, the MD of Brandon and Partners, is also the co-author of the book, “Survival of the Savvy: High-Integrity Political Tactics for Career and Company Success”. While many people think of office politics as something negative, Rick Brandon is of the view that being savvy regarding office politics can be the key to success. He also thinks that you do not have to abandon your ethics. In an article in the Houston Chronicle on 27 February 2005, Rick said that every company has ego, turf battles, power moves, hidden agendas, and that decisions are often made based upon your image and perceptions about you rather than the validity of your ideas. He stated that a savvy person knows how to handle these hidden, sometimes taboo, topics. Accept office politics as a simple fact of company life and rather view it as a way to gain influence and impact with integrity. Study the power dynamics, the unwritten rules and the sometimes secret but real score card in your company. Just doing your job is no longer enough. You need to protect yourself from sabotage and hidden agendas. Figure out your “corporate buzz” – your reputation attached to you and your team- and whether it’s fair or not, whether it’s accurate or not. For example, notice how you’re treated. If you are never appointed to a cross-functional team, perhaps you are viewed as lacking cross-organizational knowledge or lacking a strategic perspective. Once you know, decide how to tackle negative or destructive perceptions. For example, note the jargon that you use that might perpetuate negative buzz and stereotypes. Learn to detect deception and filter misleading information. Identify whether you are overly political or under political. If you’re under-political (keeping your head down, focusing only on your work you may not notice the power and political dynamics and it may hurt your career. If you are overly political, you may be perceived as abrasive and turning people off through alienating others as you climb to the top of the hierarchy. Gaining more influence on the job – helping you to sell your ideas and get more recognition for yourself and your team. Creating more business impact – giving you the satisfaction of seeing how your ideas and results make a positive impact for the organisation. • Openly – instead of whispering about it behind closed doors, sweeping it under the carpet, or whining at the water cooler. • Constructively – as ethical politics and strategic influence enabling good people to make a positive impact. • Objectively – so business leaders have a concrete map for systematically navigating power and politics. • Positively – as ethical politics and strategic influence instead of thinking politics is a dirty word. • Objectively – so a foggy, vague issue is solved with a systematic map for navigating power and politics.